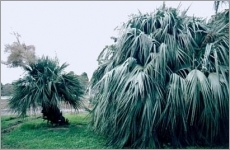 This is a tall, handsome palm (to about 25 metres (80 feet) tall with a spread of about 2 - 2.5 metres (10 - 15 feet)) and a gracefull appearance. 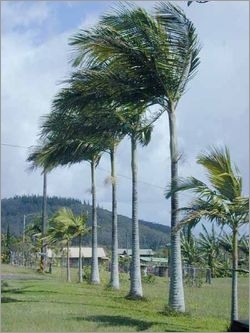 The leaves, up to about 2 metres( 6-7 feet) long, are stiff pinnately compound feather-like fronds and have a tendency to rotate 90' to expose the whole leaf in profile (Figure 2). The leaflets are all in the same plane, bright green above with a silvery underside.